Global Domains International is leading the way with Emoji domain names. Emoji popularity continues to grow and it’s only a matter of time before we see widespread usage in domain addresses. The demand for Emoji domain names is so great that we decided to allow text and Emoji mixing. It’s the newest universal language for this young generation. Don’t miss out; register your Emoji domain today! 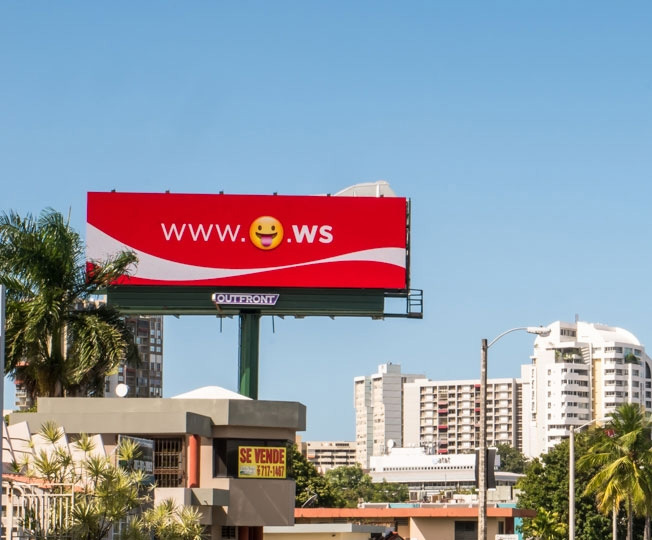 The campaign was first covered covered by Adweek in their story "Coca-Cola Spreads Happiness Online With Emoji Web Addresses: Domains for every joyful face." Other companies including Taco Bell, Domino’s, Norwegian Air Shuttle, and Ford Motor Company have run marketing campaigns using .WS Emoji. The Unicode Consortium is frequently adding Emoji characters, mobile devices are making it easier to work with Emoji domains on a regular basis, and we are seeing new Emoji blogs and keyboards showing up on websites almost daily. Budweiser even recently launched a new site promoting a product at .ws . There are currently thousands of different supported Emoji characters. A full list of current and proposed Emoji can be viewed at the Unicode Consortium's website. A quick visit to their page will allow you to easily visualize the ways you can use these unique domains to drive customers to your mobile sites. These domains are particularly well-suited for use on mobile devices where Emojis are predominantly used. They offer a visionary new way to connect with target audiences on their smartphones and tablets. Don’t miss the and register your .WS Emoji today. Get Yours Now!